Speedmonkey: Do We Really Want A UK-Spec Mustang? Do We Really Want A UK-Spec Mustang? So now we know what the 2015 Ford Mustang looks like. And we know that it'll get a steering wheel on the right and a 2.3 litre EcoBoost engine as well as the V8. We also know that Ford are talking about future power-plants. Diesel and hybrid Mustangs are being considered for the eco-obsessed and taxed to the hilt Euro market. 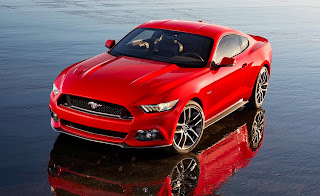 Back in February 2013 Sharon Endacotte wrote Ford Mustang euro style - Is it really what we want? "A two litre Ecoboost? That’s like having your midlife crisis in a Mondeo...That would be fine if we were getting a choice in the matter, but a bit of poking around in the press releases and muscle car fora suggests that we won’t, because America thinks that Europeans don’t like big V engines, apparently. I know there’s a global economic crisis, I know European fuel costs are much higher than in America, but even so… that’s just not right. Europe is the home of the quad turbo W16, for goodness sake." "...it might look like a Mustang, but under the skin, it’s a bit of a pantomime horse." Which brings me to the central questions. Would you buy a £30k 2.3 litre 4-pot Mustang? Would diesel ever be considered acceptable in a Mustang? Or would it suit a hybrid engine? Please feel free to comment below, on Twitter or Facebook.